Feel the vibe – an alluring mix of world-class dining, music and nightlife coalescing in one space. Tao Group, a leading entertainment and dining group, is bringing its hot vibe-dining concept from the United States to Singapore in its first foray into Asia. Located at the iconic Sands SkyPark, on the 57th level of Tower 1, Lavo Italian Restaurant & Rooftop Bar at Marina Bay Sands is a fresh and unprecedented dining concept in Singapore that is sure to take the local dining and nightlife scene to new heights. Here’s what you can expect. Under the guidance of group executive chef Ralph Scamardella, who has over 30 years of experience under his belt cooking at restaurants like Carmine’s at The Plaza Hotel in New York, the kitchen presents award-winning Italian-American cuisine that is bursting with flavour. Think dishes such as linguini with clam sauce, chicken parmigiana and the ultimate wild card – penne a la vodka. Another masterpiece in Lavo’s food hall of fame is the Lavo one-pound meatball that’s oozing with spices and topped with a sinful mountain of ricotta cheese. Pump yourself up with Lavo’s vibrant world-class entertainment. Go from dining to dancing the night away thanks to live DJ sets guaranteed to get your feet tapping and hips swaying. Unwind at the lavish indoor and outdoor lounges surrounded by a lush garden terrace that provide a relaxing retreat from the crowd. Fancy something to freshen up your palate after a satisfying meal? Waltz to the outdoor bar and gelato cart on the terrace and savour a zingy cocktail or scoop of gelato under the stars. At Lavo, every interior design detail is meticulously put together by famed design company ICrave from Manhattan. Notice the touch of old-school charm with the rustic bricks, antique mirrors and refurbished subway tiles in a luxurious space that is reminiscent of the nineteenth century. 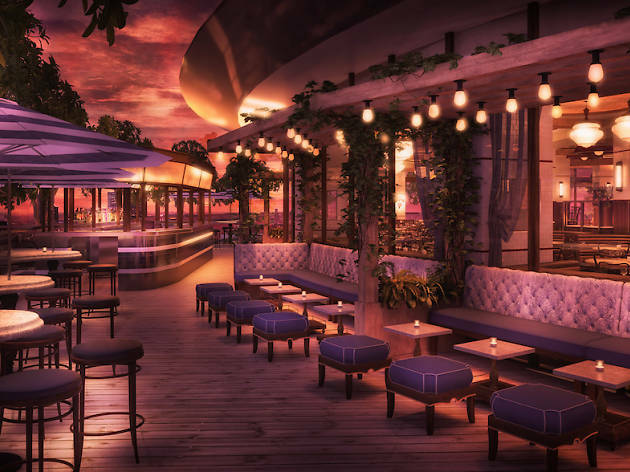 Marvel at the curved tiled bar, state-of-the-art wooden wine cabinet and get cosy in Lavo’s trademark leather booths – who knows, you might even sneak a peek at A-listers and celebrities who call the New York and Las Vegas outlets of Lavo home. The contemporary glass-wrapped venue overlooks the stunning city skyline, which is the perfect backdrop for a spectacular evening. 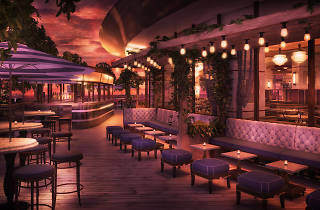 With impeccable food, creative cocktails concoctions and an exciting nightlife, Lavo is bringing an exciting new way to dine in Singapore. It opens to the public in January 2018 but is hosting a New Year’s Eve party to ring in 2018 with a special guest host, Jamie Foxx. Keep your eyes peeled for how you can snag an exclusive invitation to the party by visiting lavosingapore.com and marinabaysands.com/lavo. 57/F, Tower 1, Sands Skypark, Marina Bay Sands, Bayfront.